Mani Ratnam aka Maniratnam's next titled! Here’s an exciting news for all the Mani Ratnam fans out there. The title of his upcoming movie, starring Dulquer Salman and Nithya Menen might apparently be ‘Okay Kanmani’. The news was fetched from trusted sources close to the team. It must also be noted that the two words in the title appears in the same order in the song Pottu Vaitha Kathal Thittam, from Singara Velan. 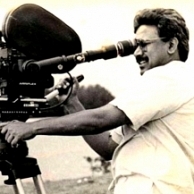 Mani Ratnam started off his career as a filmmaker, who made movies that revolved around Madras and that had sensibilities that were exclusive to the people of Madras. “No one knew Madras better than Mani Ratnam”, was once the general opinion. But, eventually he moved on to do more pan-Indian subjects, having to cater to a wider audience. But, from the sound of his next title, it definitely appears like Mani Ratnam is coming back to making his ‘exclusive to Madras’ movies. However, we do not have any concrete details as yet about the title, where the main story takes place, except for the fact that the team, including the director, Dulquer, Nithya Menen and Prakash Raj, was spotted shooting near a bank in Parrys, Chennai. Who Will Play The Lead Role In Mani Ratnam's Next? After Mani Ratnam, It Isn't Gautham Menon, For Arvind Swami ! People looking for online information on Dulquer salmaan, Mani Ratnam, Okay Kanmani will find this news story useful.